Welcome to Craig Chiropractic, where we look forward to helping you embark on your journey to optimal health and wellness. We think you’ll appreciate our casual, homey atmosphere that feels like anything but an antiseptic doctor’s office. Many of our patients remark about how much they love our office, which was formerly an Old Mill home. When you come in, you’ll be greeted before being invited to complete a few pages of paperwork. The paperwork shouldn’t take more than 10-15 minutes to fill out. Dr. Craig will provide a brief explanation of how chiropractic works and then begin a consultation with you, followed by a comprehensive examination. After some explanation of what he has found, he will perform a full back chiropractic adjustment. Please note that we don’t do X-rays at the office. You’ll schedule your next appointment for the next few days and be sent home with some instructions. From the time you walk into the door to the time you leave usually takes 45 minutes to an hour at the most. While many patients experience some relief from their pain after their first adjustment, it’s critical to understand that getting better is a process, not a singular event. We get the ball rolling so patients can begin to feel some improvement, usually after the third or fourth adjustment. 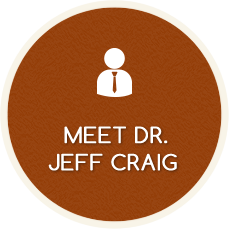 Dr. Craig’s goal is to give you the results you seek without a lot of talk. Expect a fantastic experience at Craig Chiropractic! We will meet you where you are in your health journey. Book an appointment today and ask about our New Patient Offer.